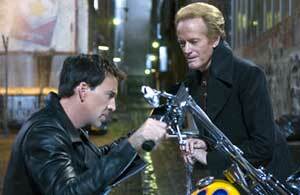 Johnny Blaze (Nicolas Cage) is a motorcycle stunt rider who sells his soul to the Devil. Now there's a sentence to strike glee into the heart, wouldn't you say? And certainly Nicolas Cage attacks his role in this offbeat Marvel comic adaptation with bucketloads of glee. Yes, Cage fans, rejoice - your patience has not gone rewarded. Forget The Wicker Man (if only) and (eek) National Treasure: this is the edgy, frenetic, madman's Elvis we know and love from Wild At Heart and Raising Arizona. Tricked by Mephistopheles (Peter Fonda) into signing away his soul (it's easily done) in return for a cure for his father's cancer - a cure which is then rendered pointless as his father is killed in a bike crash the following day - Blaze's life becomes one long suicidal Evil Knievel stunt show, as he tries to outride the Devil. Of course, he can run but he can't hide (or, indeed, kill himself) and eventually Mephistopheles catches up with him to demand his pound of flesh. 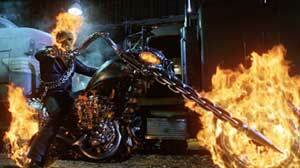 And so Blaze becomes the Ghost Rider, a big scary biker with a flaming skull and an enormous metal motorcycle that looks like the kind of thing you could buy in miniature off the back of the telly pages for £39.99 a month for the rest of the your life. The Ghost Rider is the Devil's bounty hunter, charged with hunting down renegade demons and returning them to Hell. And then there's some business about a contract, and some evil dead souls, and the Devil's son, Blackheart (Wes Bentley) who wants to overthrow his father and reign in Hell on earth (why does Satan never learn that if you're the Lord of all Evil, having a son is a Bad Idea?). But mostly there's Nicolas Cage, riding around on a huge, souped up Harley, leaving a trail of fire in his wake and shooting bad one-liners from the hip while curling his lip like Elvis. Hooray! It's a shame, then, that no-one else in the film quite measures up to the crazy, entertaining standards of our camp crusader. Aside from Sam Elliot's grizzled cemetery caretaker, who becomes Blaze's mentor, offering words of wisdom in a voice so low and rumbly only moles can hear it, the performances are pretty disappointing. Blackheart and his demonic cronies act like escapees from a rubbish episode of Buffy and are no match at all for the ruthless Ghost Rider, while veteran genius Peter Fonda gives a rather lacklustre performance as Mephistopheles - and is living proof that, while the Devil may have all the best tunes, he certainly doesn't have the best hairdo. Nevertheless, there's not a dull moment in this funny, frantic and highly entertaining superhero action romp. It ends with the promise (or threat) of a sequel, as Blaze rejects Mephistopheles' offer to take back his monstrous powers, vowing instead to use them for good, and fight the Devil back to Hell. But without the charismatic powers of Cage (who, face it, is never going to sign up for a double dose of this nonsense), I'd say 'straight to video' beckons. Which just goes to show that, as Tyla always said, you can't burn the Devil - even if your head is a flaming skull.